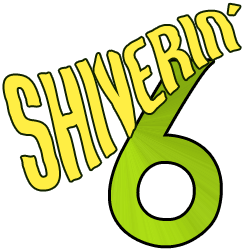 Greetings and welcome to another installment of Classic-Horror.com's Shiverin' 6. 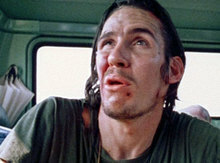 In sticking with our month long celebration of The Texas Chainsaw Massacre series, we've decided to take a look at six members of the cannibalistic Sawyer clan. Demented, depraved and downright bizarre these characters inspired over the top performances from the actors cast to play them, and also provided the audience with many chill inducing moments thanks to their psychotic behavior. Now, in order of their appearance in the series, let's meet the family. The first member of the extended Sawyer family to be introduced to unsuspecting audiences back in 1974 was a schizophrenic grave robber known only as The Hitchhiker (he becomes known as Nubbins when he appears as a corpse in the second Chainsaw). Born with a large birthmark on the right side of his face, saddled with a thick speech impediment, and suffering from mental instability, he is a bizarre individual who sets the tone for the sordid cast of characters found throughout the series. The middle brother of Leatherface and Drayton Sawyer, he is perhaps the least threatening of the three siblings as he lacks the physical strength of the former and the cunning intelligence of the latter. This is not to say that he is harmless however; he is prone to erratic behavior, sometimes leading to self mutilation or violent outbursts towards others, which intensify when he becomes excited. Edwin Neal looks, acts, and becomes this part in a standout performance. Drayton, the eldest sibling in the Sawyer clan appears in the franchise's first two features. In both films, he leads a dual existence. On one hand, he seems to live a somewhat normal life as the proprietor of The Last Chance Gas Station in the first film, and an award winning chili cook in the second. On the other hand, he is an abusive father figure to a family of murderous cannibals who antagonize him into fits of violence on a regular basis by making mistakes that could be noticed by the authorities. Although he is much more intelligent than most of the family members on this list, he, like all Sawyer's suffers from a mental illness. A multiple personality disorder seems to be at the root of Drayton's problems as he swings from showing what seems like sympathetic concern for his captives at times, to sadistic glee as they are being tormented the next. A good example of his disorder at play is the fact that he claims he "can't take no pleasure in killin' ", but at the same time he has no problem using the remains of the family's victims for meat in his award winning chili. The duality of this role is handled with deft perfection by the late Jim Siedow who makes the most out of the many sides of Drayton Sawyer. 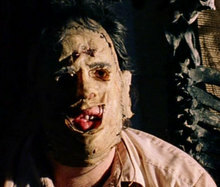 Although Leatherface appears in all four of this month's featured films, the character is, for all intents and purposes, defined in Tobe Hooper's shocking original feature. 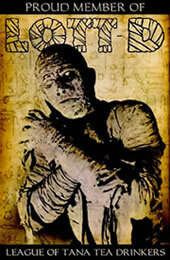 There he was cast as a deformed, mentally challenged man-child who hides his face behind masks made of human skin. Leatherface is, in fact, a victim in his own right. Lacking intelligence and incapable of understanding right from wrong, he is a tool of his psychotic brothers. Being raised in a house filled with unstable employees of a slaughterhouse, taught to kill for the family at a young age, and living under the constant fear of physical abuse are a mere three issues (of the many) at the core of what is a textbook example of a character that is horrifying as well as tragic due to his circumstances. A former slaughterhouse employee who lost his job years ago due to technological advances in the industry, Grandpa Sawyer is a wheelchair bound, centenarian who appears to be more dead than alive in the first two Chainsaw films. This however does not stop him from being a major influence on the ensuing insanity as he commands the utmost respect from the murderous clan who show their appreciation by saving "special" victims for him. The attempted murder of these victims become classic scenes in the series due to Grandpa's advanced age, and lack of the necessary strength to strike a death blow. 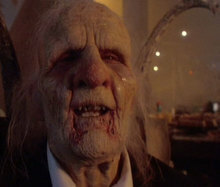 In the third entry into the series, Grandpa has passed on and is shown as a corpse. Continuity goes out of the window in the fourth picture where he appears younger and healthier than ever. When Tobe Hooper returned to film a sequel to his original classic he came equipped with a screenplay that was laced with black humor and a bit more of the outrageous. The character of Chop Top sums this up in perfect fashion. Yet another brother in the clan, his absence in the first film stems from him being off serving his country in Vietnam. This experience has left him prone to, among other things, 'Nam flashbacks. The twin brother of The Hitchhiker from the first film, he suffers from the same schizophrenia that haunted Edwin Neal's character, making him an extreme danger due to his unpredictable behavior. Chop Top dresses in the hippie fashions of the 1960s, wears a wig to conceal a plate in his head (a war injury, which he picks at frequently with a hot wire hanger), and is never short of one liners. Bill Moseley throws himself into the role with reckless abandon, providing the series with a character that is both frightening as well as hilarious. 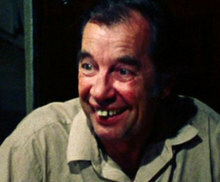 The fourth entry in the Chainsaw series places the character of Vilmer Slaughter in the role of the primary antagonist. Although the last name has changed the intentions of the character are just as insane as they were in previous franchise installments. As the proprietor of a late night wrecker service, Vilmer prowls the darkened back roads of Texas searching for victims to take back to the secluded home that he shares with his brothers (W.E. and Leatherface) and grandfather. A true psychotic, Vilmer thrives on violence and gets an extreme rush from the torment he inflicts upon not only his victims, but all those around him. In a strange move for the series the character was written as a pawn for an underground organization, something quite different for the series. McConaughey goes over the top with a crazed performance here, and although he's probably not proud of it, it's one of the more fascinating aspects of the film. Submitted by Juankybates (not verified) on Fri, 2010-11-12 21:00. Awesome family, but I think the grandpa is not the same of the fourth installmente; I think the fourth movie introduced a new family (the Slaughters), for that, this is named "the next generation". For me, the original Sawyer members are Drayton, Grandpa, Chop Top, Nubbins and Leatherface (the other members of the third film not have continuity with the related on the first two movies) well, and the grandma corpse, of corse!